Braces are not just for children and teens anymore. With modern orthodontic technological advances, adults are having their teeth aligned as well. As may be expected, adults aligning their smiles have different concerns than their youthful counterparts. Let’s take a closer look. Lack of bone material between tooth roots which results in a loss of blood supply. Gingival infections (gum disease) which can result in tooth loss. Jaw bone loss due to lack of chewing pressure from missing teeth. As the oral tissue age, they take longer to adjust when your teeth are shifted. Jaw pain, including temporomandibular joint disorders, facial pain, earaches or headaches. A rise in gum disease and tooth decay from not being able to clean your teeth properly, the wearing down of tooth enamel, as well as bone and gum erosion. Difficulty speaking, bite or chewing and stomach issues (from not being able to chew your food). 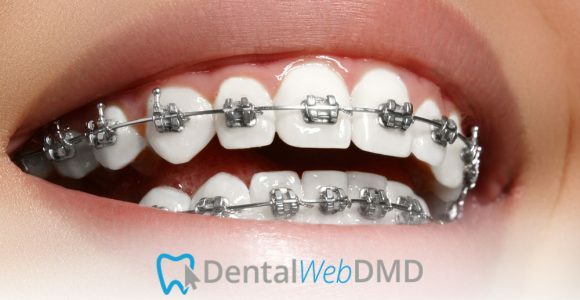 Wearing braces generally takes longer with adults than children or teens. While the treatment time depends on your teeth, you can expect your time in braces to be anywhere from 18–30 months. Straightening teeth involves bonding small brackets onto the front of the tooth. These can be made from traditional metal or the increasingly popular, ceramic. Ceramic (or clear) braces are made from a composite that blends with the color of your teeth. Metal bands may be placed on the back of the teeth, and arch wires placed inside the brackets that apply constant pressure on the teeth as well as after your orthodontist adjusts them during scheduled visits. Other forms of tooth straightening use lingual braces which are worn behind the teeth. Then you have Invisalign or ClearCorrect, which are custom-fit plastic aligners worn over the front of your teeth. Your orthodontist gives you a series of aligners that you change out every two weeks as your teeth are gradually and aligned. Root Resorption: As people age, root resorption becomes an issue when straightening their teeth. Whether due to oral habits, genetics, or the kinds of roots that you have, root resorption arises as the mouth reabsorbs the root of a tooth, and this ends with the tooth having no support. If you are a candidate for root resorption, you orthodontist will watch your progress carefully to catch the tooth if this is likely to happen. It can be treated early on, otherwise, the tooth can loosen and fall out. Overbite: When correcting the malocclusion (or misaligned bite) in adults, if the overbite is too deep there might not be sufficient room for the teeth to move unless one or more teeth are extracted to make space. Also, with age, adult teeth may wear down, making the overbite worse. Temporomandibular Disorder: Another issue adults have is a higher risk for TMD. This jaw joint disorder, known as temporomandibular disorder can arise during orthodontic treatment. Your orthodontist should evaluate your risk for TMD before recommending braces. Tooth Extraction: Adults can also experience issues if they have had teeth extracted. Sometimes your orthodontist may need to add bone material to older extraction sites to support the new positions of the shifting teeth. Adults can also find it more challenging to close gaps between teeth after an extraction because their bones don’t work with applied pressure from braces as easily as a child whose bones are still growing and are more malleable. Expectations: Something children, teens, and adults DO have in common are the psychological issues that may arise. For example, worrying about how you look in braces, how willing you are to follow your orthodontist’s guidelines, feeling pain during the process of shifting the teeth, and what outcome you will see from the treatment. Wearing braces are no longer just for kids and teens. Adults can enjoy the health benefits of an aligned smile, as straightened teeth are easier to keep clean, helping you prevent tooth decay and gum disease.